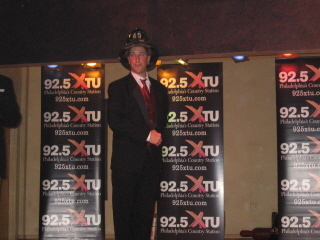 FF/PM Bob Race of the NFD was recently promoted to the rank of Sgt. 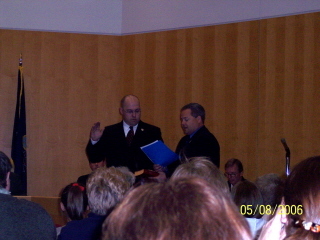 within the Bensalem Township Police Department. The officers and members of the NFD wish him the best of luck and remind him to be safe while patrolling the streets of Bensalem. More than 10,000 Emergency Service Personal Honored slain Philadelphia Officer Gary Skerski Friday afternoon at the Resurrection Cemetery in Bensalem. 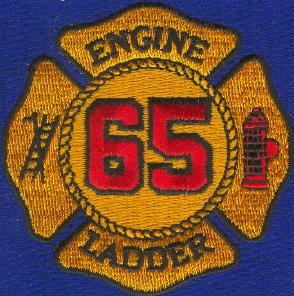 Ladder 65 and Ladder 10 performed a ladder cross at the entrance to the cemetery. On Wed. Dec. 28, 2005, Emergency Services were dispatched at 7:27p.m. to 6400 Hulmeville Road for a personal care facility fire. Living nearby, you responded from your homes directly to the scene. Deputy Chief 44, Michael Dydak Jr., arrived on scene to find the building being evacuated by the staff. Deputy Chief Dydak found heavy smoke in the ground floor hallway with a confirmed entrapment. While the fire was extinguished by the sprinkler system, Andrew Dydak, along with Bensalem EMS Chief Thomas Topley, proceeded into the building where they discovered an elderly resident who had suffered third degree burns over 90% of his body. Disregarding the heavy smoke, they removed the victim from the building, carrying him over steep terrain to an arriving ambulance. The patient later succumbed to his injuries. You are hereby commended for the quick, coordinated life saving efforts that you put forth in trying to save this victims life and your dedication and commitment to protecting the residents of Bensalem Township. The officers and members of the Nottingham Fire Department wish to extend our congratulations to the NFD's graduating members of the class of 2006. Alan (Al-B) Welsh Jr. , Mike Sekulsi and Chris Grow. Best of luck to you guys.. The 2006 Nottingham Fire Safety Day (Open House) was a huge success. We estimated that well over 1,000 people attended the event and learned the importance of fire safety. 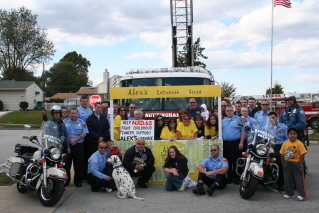 We were also able to raise over $300 dollars with our Alex's Lemonade Stand. The money raised will be donated to Alex's Lemonade Stand to help with the Fight Against Childhood Cancer. The officers and members of the Nottingham Fire Dept. would like to thank all of the organizations and local businesses that assisted us and helped make it all possible. Thanks to all who participated in this year's event. 141 Tickets were sold and 67 toys were collected. Special thanks to The US Marine Corps , Outback Steakhouse , The Bensalem Police Department , Bensalem EMS , and the Cornwells Fire Company for making this event a success. The officers and members of the NFD would like to congratulate FF/EMT Derek Felsman on being hired by the Pennsylvania State Police. Derek's life long dream was to become a Trooper with the PSP and on January 22, 2007, he will begin the State Police Academy. Derek was one of the live-ins at the NFD, while his service and commitment will be missed these next few months, we couldn’t be prouder of him. Keep up the good work Flushy! The following NFD firefighters were recognized with a Unit Citation by Bensalem Township for their heroic efforts in saving two children from an apartment fire at the Creekside Apartment Complex in September 2006; Chief Ron Harris, Deputy Chief Robert Sponheimer, Captain Jeff Sarcewicz, FF/PM Tom Topley, FF Mark Pachucki,FF Rocky Fontaine, FF/EMT Derek Felsman, FF/EMT Alan Welsh Jr., FF Thomas Callahan. In addition, PA State Senator Tommy Tomlinson was on hand to present FF Rocky Fontaine with Citations from the PA Senate and the PA House of Representatives for his individual heroic efforts he displayed that day. FF Fontaine located the kids unconscious and in respiratory arrest during a secondary search of the apartment. Because of these firefighters heroic efforts that afternoon, two young children got a second chance at life. The Officers and Members of the Nottingham Fire Department congratulate each of them in continuing to display the dedication and professionalism that has made the Nottingham Fire Department what it is today.